The Galloway Cattle Society has launched a new Quality Assurance scheme, unveiling a set of quality standards that will underpin the Real Galloway Beef logo. 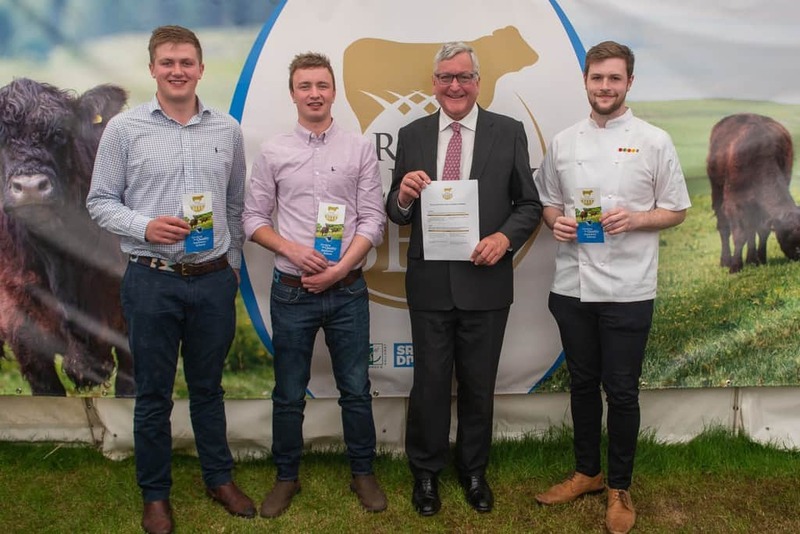 The quality assurance scheme was launched by Fergus Ewing MSP, Cabinet Secretary for the Rural Economy and Connectivity, and by young members of the Galloway Cattle Society at the Royal Highland Show yesterday (21 June). The scheme has been developed with Acoura as a bolt on to existing QA schemes. The Standards note that cattle sold under the ‘Real Galloway Beef’ brand must have at least one parent registered, should be primarily grass fed and housed outside. The development of the quality assurance scheme forms a key element of a two year project called Defining Galloway Beef part funded by Dumfries and Galloway’s LEADER programme to develop new ways of promoting Galloway Beef and to encourage more farmers to think about stocking Galloways. “This project is about putting the systems in place that will ensure a successful future for the Galloway cattle breed itself, and to support profitable, sustainable farming in the future for the young farmers’ who will become the custodians of the breed. Making sure Galloway Beef is clearly identifiable is the first stage in this process. Fraser Cameron, Senior Sous Chef at the Michelin starred restaurant 21212 in Edinburgh, aged 21. Fraser, who is originally from St John’s Town of Dalry in Galloway, is passionate about the quality of Galloway beef, in particular the intense flavour and consistent fat marbling. He is hoping to develop his knowledge about the breed and intends to share his experiences with his peers. Ian Carlisle, aged 20 from Dumfries, works in his family business Border Meats based in Lockerbie. Ian is interested in developing an insight into the Australian farming and meat processing industries and hopes to apply that insight to develop how Galloways are processed in Scotland. Callum Park, aged 25 from Sanquhar, is Vice Chair of Dumfries and Galloway Young Farmers. Callum is interested in learning about different beef cattle management techniques, in particular exploring different approaches to producing quality beef profitably.